From an acclaimed and award-winning young writer comes an assured and intensely moving debut collection set in the eye of life’s storms. In Corpus Christi, Texas-a town often hit by hurricanes- parents, children, and lovers come together and fall apart, bonded and battered by memories of loss that they feel as acutely as physical pain. A car accident joins strangers linked by an intimate knowledge of madness. A teenage boy remembers his father’s act of sudden and self-righteous violence. A “hurricane party” reunites a couple whom tragedy parted. And, in a luminous and unforgettable three-story cycle, an illness sets in profound relief a man’s relationship with his mother and the odd, shifting fidelity of truth to love. Told in fresh, lyrical voices and taut, inventive styles, these stories explore the complex volatility of love and intimacy, sorrow and renewal- and expose how often these experiences feel like the opposite of themselves. From the woman whose young son’s uncanny rapport with snakes illuminates her own missed opportunities to the man confronting his wife and her lover in a house full of illegal exotic birds, all the characters here face moments of profound decision and recognition in which no choice is clearly or completely right. 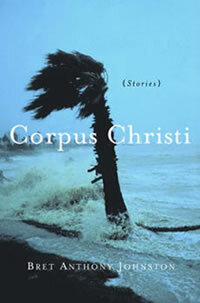 Writing with tough humor, deep humanity, and a keen eye for the natural environment, Bret Anthony Johnston creates a world where inner and outer landscapes are united by their experience of grief and hope, where cataclysmic events cut people loose from their “regular lives, floating and spiraling away from where we had been the day before.” Corpus Christi is an extraordinarily ambitious and accomplished debut, one that introduces readers to one of the few remaining mysterious parts of the country and marks the arrival of an important, exquisitely talented voice to American fiction.